One particularly foul winter evening, with rain lashing the windows of our house in Scotland, I raised the subject of having a really good summer paddling holiday – treating ourselves to something special – a “once in a lifetime” trip. We had a list of what we wanted … and what we didn’t …. We wanted to see the remote east coast of Greenland. We wanted the use of good quality boats and kit. We wanted to maximise our time by having a knowledgeable guide for the area. We wanted to know that our safety and enjoyment were priorities. We wanted to feel that we had a say in the trip planning. We didn’t want to be led by the hand. We didn’t want to feel that covering miles was the main objective. We wanted to feel like we were getting value for money. 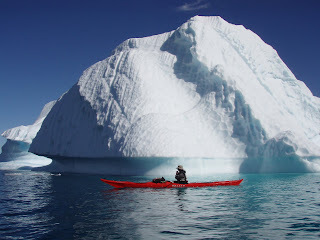 …… oh, and we wanted to see icebergs … lots of icebergs!!! And so, in the summer 2010, we found ourselves having a fantastic time, paddling from Ammassilik with Martin and a very friendly group of other punters. We were pleasantly surprised by how well looked after the boats and other equipment had been … I paddled an NDK Explorer and enjoyed the novelty of dry gear in all the hatches … something I’ve never known before! We were immediately comfortable with Martin’s leadership style – never dictatorial or in-your-face; he would give us all the information he had, put forward a few suggested options and then we, as a group, made the decisions on where to go, how quickly and where to stop for the night. We deviated from this once – and that was when Martin decided that conditions were not safe for continuing with the original plan – based on his considerable experience of the ice and how quickly things can change out there. During our journey, we explored several abandoned settlements, went for walks up into the hills and discovered old graves and mysteriously arranged stones. We were taken with Martin’s knowledge of the area and his obvious love and enthusiasm for this corner of the world. It was clear that he enjoyed sharing these with us. We felt that we got a huge amount out of our time in Greenland and very definitely satisfied our value for money criterion …. and our iceberg spotting requirements! Perhaps the best way to sum up this trip is that we had always considered it a one-off “trip of a lifetime” type of thing… but that’s completely gone out of the window! We’re already making plans to go again – and won’t have to think twice about which operator to use!! If you’re wanting a really marvellous experience in one of the few truly wild places left in the world …. sign up for one of these trips … we promise you won’t regret it!